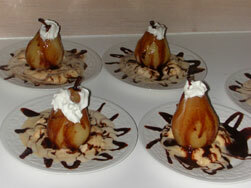 This absolutely fantastic famous dessert consist of poached pears in light vanilla syrup or white wine, served with a scoop of vanilla ice cream and warm chocolate sauce. For a touch of decadence, garnished with fresh whipped cream. Classic, simple and oh, so delicieux! Experience the pure magic of this fantastic French version (from the Burgundy Region) of the American-style fruit cobbler. Luscious Strawberries, Blueberries and Juicy Raspberries are drizzled with Cassis liquor and crisped with special lemon laced cookie crust. 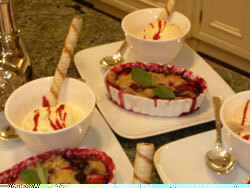 Served with French Vanilla Ice Cream (of course), this dessert will transport you into another dimension! Namely Heaven! 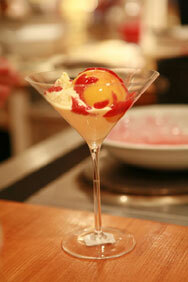 Chef Blažena’s award winning recipe, published in Kiwi Magazine in the US and in Australia. Juicy chunks of mango, pineapple and other tropical fruits, tossed in special tequila (optional)-lime dressing, garnished with coconut shavings will surprise your palate – a fruit salad will never be the same after tasting this one! Juicy peaches drizzled over with raspberry coulis, with a touch of Himbeeren Geist (Raspberry eau-de-vie) served with a scoop of ice cream (optional). 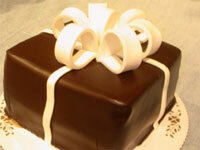 We provide the cake of your dreams from simply understated to sophisticated and very elegant - to reflect your taste. We work with an experienced (over 40 years) European bakery and deliver incredibly delicious and attractive cakes per special orders. 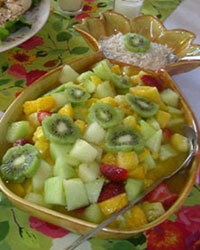 Just an example of our variety of fresh fruit parfaits. Can be served also Napoleon style. Very impressive and absolutely delectable layers of airy cheesecake mousse with chocolate cake layers. Covered with dark chocolate ganache, this square box cake comes decorated with an edible colored icing bow, which can be made to match to your theme or occassion. Impressive and utmost delectable! Luxurious finale to any menu: decadent, yet light textured chocolate mousse over Lady Fingers base (optional) rounds up the feast! Swiss Chocolate Gâteau – the ultimate dessert! This fine Swiss Chocolate Gâteau Cake takes you away! 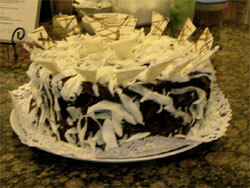 Layers of dark & white chocolate mouse on a light, chocolate cake base, decorated with white chocolate shavings. 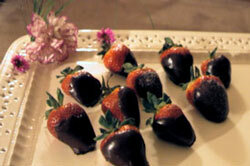 An ultimate experience in desserts! Melts away-in-your mouth! 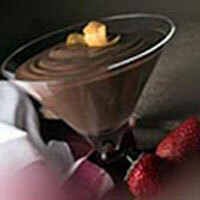 Succulent dessert from juicy oranges in a special Grand Marnier Mousse in elegant goblets. Delicious 16 century recipe from the Orangeries of Fontainebleau, simplified for today’s American use. However, the romance remains! In between spoonfuls, get or give kisses – the rest is up to you! Oh, la la! Luscious Hi-Pie brimming with apples, rhubarb, strawberries, red raspberries and blackberries, enveloped in a flaky crust! Every bite is absolutely fantastic! 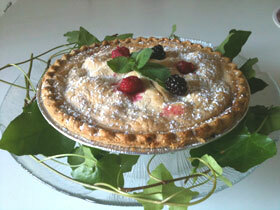 A real treat for fruit pie lovers!